One of our FAVORITE authors here at Boys in our Books, Joanna Chambers, stops by today for an interview! We’re discussing her new holiday book, “Humbug”, and some other fun stuff! 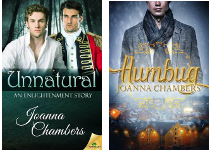 Comment on today’s post and enter to win both Joanna Chamber’s “Humbug” AND her to-be-released story “Unnatural”. YES! Joanna Chambers is IN THE HOUSE (no one says that anymore, huh? )…to talk to us about her new holiday release, “Humbug”. Welcome Joanna! We’re thrilled to have you here! JC: And I’m thrilled to be here! So, “Humbug”, wanna give us the quick and dirty about this story? JC: Ok, the elevator pitch is that it’s a contemporary queer romance version of A Christmas Carol. My Scrooge is Quin Flint (skinflint, geddit?) a management consultant who specialises in outsourced redundancy exercises. Rob Paget (Bob Cratchit) is his hot, put-upon colleague. And it’s your first foreay into self-publishing, correct? What made you decide to self-pub this one in particular? JC: I dipped my toe in the water with self pubbing last Christmas. I was part of an anthology organised by Josh Lanyon. However, Josh took care of pretty much everything so this is the first time I’ve done everything myself. The main driver for self-pubbing this story was timing, really. The schedule on Unnatural (released 24 Nov) was such that I knew I wasn’t going to have time to write Humbug till Sep/Oct – that’s far too close to publication to work with a publisher on an xmas story, so it was a choice between publishing it in 2016 with a publisher or self publishing it. I’m lucky that I have a number of online friends who self pub who gave me great advice and recommended editors, cover artists and formatters. You have a few other stories releasing this and next month. You must have been busy writing this year. Tell us about the other projects? JC: I’ve already mentioned Unnatural – that’s a spin off story from the Enlightenment trilogy – the story of Captain Iain Sinclair (who appears in Beguiled) and James Hart, a scientist and Iain’s childhood friend. Are short stories any easier or harder to write than full length novels for you? So, we’ll admit, a couple of us have already read “Unnatural” and LOVED it. James and Iain are amazing together! I know this is your “Humbug” tour stop, but can you tell us a little bit about the experience of writing “Unnatural”? JC: I decided early on to have a back and forth narrative because I love stories where – as a reader – I discover things that put a new spin on what I’ve just read or am just about to read. But that’s kind of…um, not easy? I also really wrung my hands over the plot and character backstories. I wrote my story plan a whole bunch of times – 4 or 5 at least (and I plot in detail so that takes quite a while). So yes, it was kind of intense and gruelling. But there were parts that were a pure pleasure to write – the game of hide & seek, the scene where James realises Iain prefers men, the butterflies scenes. Those were all really enjoyable to craft. JC: TOTALLY happy holidays! I adore Christmas (and to a lesser extent Hogmanay). My husband and kids do too. We have a host of family traditions we’ve created over the years that we faithfully follow. And what’s next up for you? Any new releases in 2016 you can tell us about? JC: I’ve signed contracts for a couple of novels that I’ll spend all of next year writing – but those won’t release till 2017 annoyingly. So the plan (hopefully) is to also put out something self-pubbed next year – maybe a couple of things, depending on how productive I am. Thank you SO much for stopping by! You’re one of our favorites so we love having you here! JC: And I love being here! Thank you for having me! Quin Flint is unimpressed when his gorgeous colleague, Rob Paget, asks for extra time off at Christmas. As far as Quin is concerned, Christmas is a giant waste of time. Quin’s on the fast track to partnership and the season of goodwill is just getting in the way of his next big project. But when Quin’s boss, Marley, confiscates his phone and makes him take an unscheduled day off, Quin finds himself being forced to confront his regrets, past and present, and think about the sort of future he really wants… and who he wants it with. Both of these look great! I’m so ready to ready holiday stories! Thanks for the great interview! I’ve been looking forward to Unnatural and now I’m excited for Humbug too! I’m so excited for all of these, Joanna! Happy Holidays! Thanks for the interview! I look forward to your upcoming releases and good luck with self-publishing. Congratulations on your new release the book sounds very good I have a weakness for all things Christmas especially Christmas themed books. Congratulations on the new book! It sounds really good! 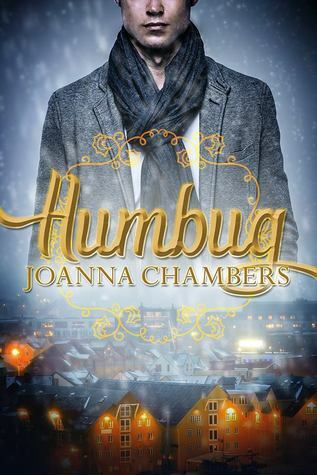 OMG – I am so excited to learn that Joanna Chambers has a new holiday book – and it is based on one of my classic favorites – A Christmas Carol. I will definitely be reading this one. And Unnatural, of course. I hope the self-publishing works out well! I can’t wait for Humbug! I love the Enlightenment series. And now there are TWO new books by Joanna. Great!! CONGRATULATIONS Angeles! You’re the giveaway winner! We will contact you at the email address you provided with your comment. Thanks for the interview! And both books look fabulous! Really excited about new work from Joanna. Could you include purchase links for Wish Come True also? Sounds great! I would love to read more. Thanks everyone – I’m excited about this one! And thanks for hosting me BIOB! I’m a sucker for a Christmas story. Looking forward to reading Humbug. (Enjoyed Unnatural too!). I adore Christmas stories. Congratulations on self-publishing – a really big step many fear to take due to lack of knowledge. Congrats on the new release and the cover of Humbug is lovely. *beams* Thank you all for your kind words! And a quick shout out to Natasha Snow for the cover which I love. “Humbug,” sounds lovely. Plus, the cover, by Natasha Snow, is gorgeous. Congrats on self-publishing. I wish you continued book success!! I know this is a HUMBUG post, but I’m so looking forward to UNNATURAL! A new author to me! Congratulations on both release’s! Going to check out Humbug now. This entry was posted on November 18, 2015 by BioB in Blog Tour, Giveaway, Interviews and tagged giveaway, holiday, joanna chambers, self-pub.